This time the Conference of Parties (COP) 23 was presided over by the Prime Minister of Fiji, a country comprising 300 islands. The event attracted much global attention and called for real action to help vulnerable island nations cope up with the effects of global warming. Questions may be raised also from countries like India about the vulnerability of Andaman & Nicobar and Lakshadweep, islands totaling 611 in number, of which only 46 are inhabited. 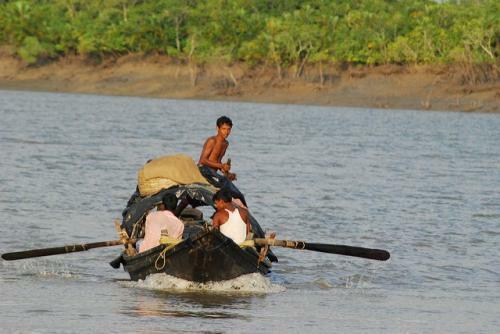 There are also islands in the Indian Sundarbans Delta. Inhabited by nearly 4.5 million people, even after 70 years of Independence the place is without proper roads and surface transport, drinking water, sanitation, healthcare and small-scale and medium enterprises. Fishing and farming are the main occupations here. To augment family income, women stand in neck-deep water and draw drag nets to collect prawn seeds for selling in the market. There is not a single technical training school for skill development in the Sundarbans. The islanders depend on the mainland for all essential commodities. Local products are sold at 1/3rd the price compared to Kolkata as there is no co-operative movement to ensure fair price of these products. After the devastating Aila on May 25, 2009, 1,300 km of earthen embankment was damaged. A total of Rs 5,000 crore was sanctioned but not even 20 per cent has been used as the Early Warning System is still to come up. New cyclone shelters have hardly been built as has been done in coastal Odisha. People remain at the mercy of nature here. Climate change is happening now. So, there is no point of waiting till 2030 when 1.2 million people have to be moved out from eight vulnerable blocks of the Sundarbans. Despite the Delta Vision Document published in 2011, no evidence of action is seen as yet. How the farmers and fishermen will cope up in far-off states? There is no doubt they need additional skills. There is no programme for skill development for future environmental refugees from these riverine islands of the largest delta in the world shared between India and Bangladesh. There is also no future plan for resettlement of climate-induced refugees in pre-designated areas. It is a paradox that these people who contribute no carbon dioxide or greenhouse gases are set to become the worst victims of climate change. COP 23 remains unknown to these people. Verbose discussions will not help. It is high time to stop rhetoric take real action. Sundarbans oil spill: who will clean the mess?